Make sure you have what you need to feel protected. 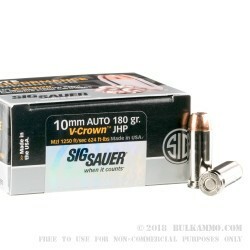 These 10mm Auto JHP centerfire pistol cartridges by Sig Sauer should do the trick! Each of these rounds contains a 180 Grain V-Crown jacketed hollow point bullet. Sig Sauer's V-Crown bullet has a v-shaped jacket at the tip to help provide controlled, uniform expansion. 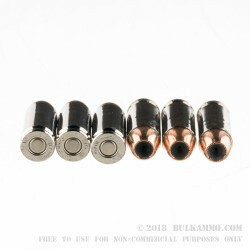 The bullet has a stacked hollow point design with an additional hollow point cavity to ensure maximum weight retention and excellent expansion at all distances. 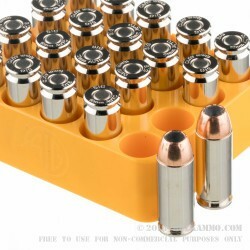 The cases are nickel-plated brass to provide smooth feeding and extraction into and out of your firearm. A low flash propellant is easy on the eyes and will particularly come in handy if you are caught in a situation where multiple shots are necessary. These rounds are Boxer-primed, non-corrosive, and reloadable. 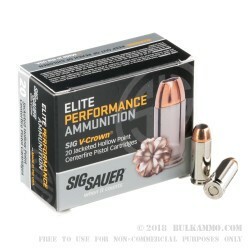 Sig Sauer ammunition was originally founded in Switzerland in the mid-1800's. They are currently one of the world's most renowned manufacturers of small arms. In the U.S., nearly 1 in 3 law enforcement professionals use Sig Sauer firearms. They are headquartered in Newington, New Hampshire. Their worldwide business group of firearms manufacturers includes J.P. Sauer & Sohn and Blaser, Gmbh. in Germany and Swiss Arms AG in Switzerland. Quality, reliability, and safety are what their products are known for.